More recondite plants #2: hardy giant pelargoniums on rampage! 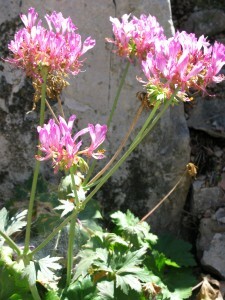 Few plants can match the giant Turkish Pelargonium (Pelargonium quercetorum) for drama or rarity. You're not likely to find this in any other American botanic garden, and only in one or two gardens in Europe for that matter. It can grow over a meter tall. Its flamboyant, hot pink trusses are startling in the backlight when you round the corner next to the Cactus and Succulent House in the Rock Alpine Garden. It has thrived in this spot for a decade or more. In nature, this occurs in oak groves (hence the specific name in Latin) in Kurdistan, on the Turkish-Iranian border (an area you are not apt to visit any time soon, I fear). It is one of only a few species in the genus that occur outside of Africa.